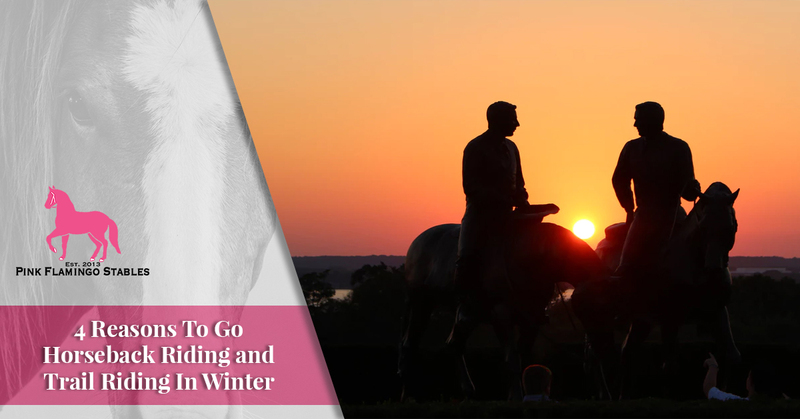 While we’re spoiling one of our points below by saying so, the weather here in the Lake Worth area is so nice that horseback riding and trail riding is almost always a possibility. No matter what time of year someone types in “horseback riding near me,” they’re going to have an excellent experience learning to ride a horse or going trail riding. Winter is no exception. In fact, here are quite a few reasons why trail riding and horseback riding lessons can actually be just as nice, if not nicer, than at other parts of the year. Let’s take a look at the reasons why we know you’ll enjoy joining us for a ride. Sometimes we think that winter here in Florida should be required to have quotation marks around it. As in, it’s been a mild “winter” here in Florida. Because, compared to a great deal of the rest of the country, it’s not really much of a winter at all. Sometimes people will be reluctant to come horseback riding in the middle of summer, and we have to admit we understand. It’s no secret that it gets very warm and very humid in Florida in summer, and some people — especially parents who don’t want their kids to get overheated — would rather seek out indoor activities. The same goes for any businesses that are having day retreats. It’s just more accommodating for everyone in the office to have their retreats in an air conditioned building. As we write this blog, it’s 69-degrees at 1:00 pm. That sounds like a nice temperature to get outside and have some fun horseback riding! Speaking of weather, let’s talk about hurricanes. If anything good can be said about hurricanes, it’s that there’s usually enough warning to put the horses away and warn people that horseback riding is not an option on a particular day. But that’s only between June 1 and November 30, when hurricane season officially begins and ends. Now that it’s December, the weather is calming down considerably. That means your horseback riding is much less likely to be interrupted because of inclement weather. It’s certainly not going to snow, even though it’s “winter” around here. Here at our stables, we host quite a few businesses that are interested in giving their employees something different in day retreats. They might be tired of a typical fun center or bowling alley and would much rather reward their employees with something a little more out of the ordinary. Something like trail riding! Horseback trail riding can also be a great alternative when businesses are looking for something fun to do during the holidays. If you hear your employees grumbling about the regular old Christmas party, why not spend an afternoon with everyone at our stables? Many major religions have gift-giving holidays in December, which means that you’ll probably have a list as long as your arm to fill. If you have someone in your life who loves horses but hasn’t gotten to spend much time with them, why not give them horseback riding lessons? We offer riding lessons for people of all ages, and we can accommodate the skill level of any rider who stops by. It’s less than a month until the new year, which means that many people are going to start making New Year’s resolutions. The most common resolutions are to lose weight, exercise more, and cook more meals at home. But so many of those things require…effort. While it might be kinda fun to cook more at home, most New Year’s Resolutions aren’t really that fun, and that’s the reason that most people fail with them. Why not make a resolution to have more fun, to take up a hobby that you’ve always wanted to? If you are interested in horses, January 1 is a great time to start up a new hobby like horseback riding! We want to teach you to ride at our Lake Worth stables. Whether you want to make it a lifelong hobby or are just here for an afternoon, we’d love it if you chose us for your horseback riding needs. Contact us today to learn more!